For over 25 years we are working as a sales representative for Gosan S.A.
For over 25 years we are working as a sales representative for Gosan S.A. which is located in Spain. 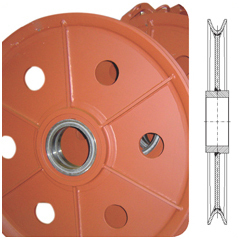 Gosan manufactures various types of sheaves, couplings and hook blocks. Manufacturing plants in Europe and the U.S.
Gosan produces over 25.000 sheaves each year with an average diameter of 1.000 mm. The majority are welded machined types, i.e., manufactured from rolled steel (or forged steel) and then welded and finished. 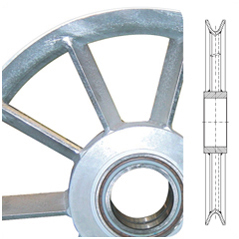 We also make other types of sheaves such as plastic sheaves and solid or cast sheaves, although in smaller numbers. Our range of welded machined sheaves includes different constructional designs that adapt perfectly to the demands of the different sectors of the market for hoisting, transport and maintenance machinery in which Gosan is present. Sheaves made of plating open down the centre with the throat formed by cold forming. 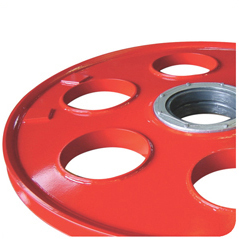 Due to their design and construction, they are normally used for small diameters. 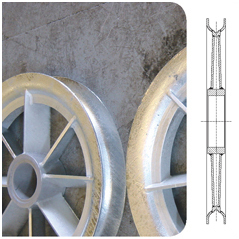 Sheaves produced with a 30% inclination, radii are in an even number and of alternating variable sections according to the diameter. Chosen generally by the group of the machine they are destined for. Sheaves made with two convex plates with which a more even stress distribution is achieved. They are of great practical use when dealing with very high starting tor-ques. Sheaves made with a lightened central core and lateral stiffeners, mounted in a radial pattern. They are typically used on high responsibility machines. These are sheaves that have their throat designed for the passage of hoisting cable connected with a linking pear. 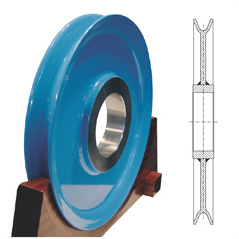 They are formed by two lateral elements welded to a central machined ring for cable passage. 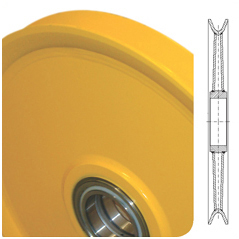 The remaining construction features of the sheave are as normal and they can also be produced with radii similar to those of Model B or Model C.
Any type of sheave to suit the customer´s requirement.